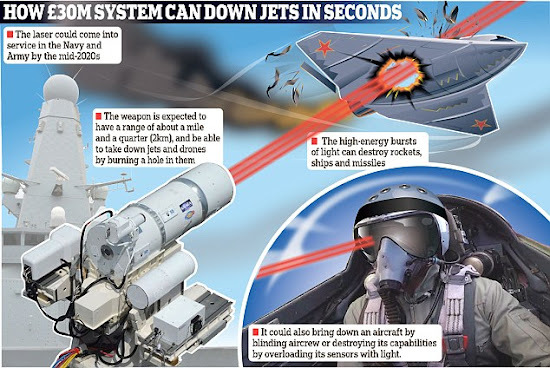 British soldiers, ships and warplanes could be going into battle armed with Star Wars-style lasers. The Ministry of Defence has signed a £30million contract for a prototype weapon from a consortium called UK Dragonfire. It will fire high-energy bursts of light capable of destroying rockets, ships and missiles in the blink of an eye. 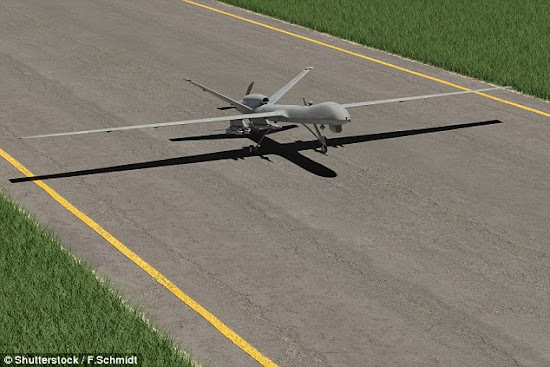 Defence chiefs also want the system, which is expected to have a range of about a mile and a quarter, to be able to take down drones. It is currently under development, with researchers aiming to find out if ‘directed energy’ technology could benefit the armed forces. If successful, the programme could come into service in the Army and Navy by the mid-2020s, and then fitted to future generations of fighter jets by the 2030s. One of the major advantages laser weapons have over traditional systems is that the munition is potentially unlimited – the system needs only a power source. It also operates at the speed of light so the time from when a operative presses ‘fire’ to the weapon hitting its target is more or less instantaneous. Peter Cooper, from the UK’s Defence Science and Technology Laboratory, said the project ‘draws on innovative research into high-power lasers’. He added that this could ‘provide a more effective response to the emerging threats that could be faced by UK Armed Forces’. The laser will ‘target and defeat aerial threats’ in three ways. It could bring down an aircraft by burning a hole in it, destroy its capabilities by overloading its sensors with light, or blind aircrew. The US military has been experimenting with high-energy lasers. In 2014 it tested a weapon system called Laws on the amphibious transport ship USS Ponce during a deployment to the Arabian Gulf.